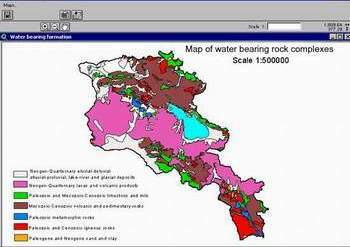 ArWater is a GIS of Armenia's fresh water resources. ArWater operates in ArcView environment and is customized through Avenue programming language. ArWater is a tool for managing the ground fresh water resources of Armenia. The software includes 1:500000 scale digital vector maps of river basins and water discharges, where water objects are indicated and have attributive tables linked to them.